The Thermosafe uses a single induction coil to directly heat the wall of steel drums and containers by an alternating magnetic field. This means there is no heat transfer by conventional and inefficient radiant elements. As there are no hot elements, the heater remains cooler than the drum being heated. No long term service or maintenance is required. Uniform heating without hot spots reduces the risk of product degradation. Accidental spillage does not present a fire hazard and personnel can work comfortably in close proximity. The low system temperature and lack of heat transfer contribute to the high efficiency of the induction heater. Power usage is extremely low at only 2.25kW. Figures indicate of energy savings of over 50% compared with conventional radiant drum heater. By using the entire drum wall input energy, the fastest practical heating rate can be achieved without product degradation. Typically, Thermosafe has proven to be 2-4 times faster than ovens. With ingress protection IP66, simple smooth surfaces and no moving parts, induction heaters are ideal for use in clean environments. Thermosafe heats by induction and therefore has no heating elements. The maximum temperature is self-limiting, and the drum wall temperature is governed by the material inside the drum. In the vast majority of applications additional control is not required. In addition to being operated at point-of-use and integrated into the process, the heaters are used extensively as replacement for, and alternatives to, drum ovens. A key point to note is that far fewer individual heaters are required than the drum capacity of an oven. For example, one particular award-winning installation of 3 Thermosafe induction drum heaters heats 20 drums per day. The ease at which capacity can be adjusted, to meet varying throughput demands and the varying heating requirements of different materials, is in stark contrast to the fixed facility of an oven. The industion heater's unique features enable the same piece of equipment to be used in a wide range of applications to heat drums and a variety of other metal items, including gas bottles, small-scale reactors and process vessels. 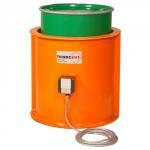 Complete access to the drum while heating enables pumps and stirrers to be employed. The drum and heater can be integrated into the system, often eliminating the first process vessel & continuous feeding of material, at regulated temperature and flow rate, can easily be achieved. Re-working and sampling of solidified or suspect material, even if heat sensitive, is a common task for Thermosafe induction drum heaters. The lack of contact with the drum surface makes this possible even when the material is in its final packing. Uniform heating and instant response makes the heater ideal for removing residues from drums, significantly reducing wastage. With full drums, these same features enable very rapid removal of solid drum contents by melting the outer layer of material. Since 1985, Thermosafe heaters have been supplied to more than 40 countries - now available for Africa via unitemp. With no heating elements and no moving parts, experience so far suggests a seemingly unlimited life, with literally no maintenance. Thermosafe is simply and encapsulated induction coil. Both ends of the cylinder are open, allowing the heater to be lowered over the drum or vessel. Alternatively, the drum can be lowered into the heater. However, as the Thermosafe weighs less than 50kg, this is unlikely to be the most convenient arrangement. Top, bottom or side flanges may be used to attach handling equioment, if preferred to manual lifting. A range of dedicated products is available but many standard forms of handling devices are suitable. Single phase 240V, 50Hz a.c.